This year 160 iconic buildings around the world are to be illuminated in green for St Patrick's Day – from Rome to Sydney via Las Vegas, China and Malaysia. Maybe that is not surprising in that the name of St Patrick has gone far and wide. But his fame has come about thanks, not mainly to slick marketing but to the waves of Irish emigrants and missionaries who have left their mark around the world in recent centuries. St Patrick's Cathedrals existed in New York, Auckland and Karachi long before Tourism Ireland or green beer cashed in! Today we are invited to reflect on the man Patrick who has contributed so much for 1550 years – and not just to the marketing ploy that has sprung up in the last couple of decades. So what might St Patrick say to his spiritual descendants today, as we rightfully celebrate his memory and legacy? Firstly, the shamrock is a popular symbol of Patrick's faith and of Irish-ness. But his teaching about the Trinity was not vague woolly spirituality. It spoke of a Father who created the people in his image and likeness, of a Son who died on the Cross to bridge the gap between the creator and his creatures and of a Spirit who makes his Temple in our bodies. That is good news for then and for now. But there is no cheap grace. Patrick's own struggles and sufferings were a testimony to that. He may have tried to supplant the teachings of the Druids – but he did not seek to replace it with a fuzzy form of religiosity that demands little and promises everything. Patrick would tell us that the healing of the world will not happen through our own work or the power of magic crystals. This year of mercy reminds us that salvation does not come from within us but through the power of the Risen Christ. Ireland needs a lot of healing. It will not come merely through changing political structures or through the production of more wealth. It will come from the healing of hearts and relationships. It is the handing on of that powerful message that is the main unfinished business in 2016. St Patrick would tell us to be proud of our heritage and culture – but to be prouder of the message that he brought. The shamrock is there to be preached, not just drowned! Secondly, he might tell us that, like many people on this island nowadays, he wasn't Irish! 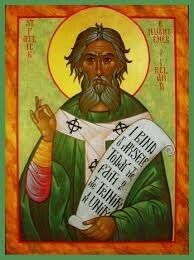 St Patrick certainly was not an early nationalist, he didn't dress like a 19th century Catholic bishop nor can he be hijacked as the original Free Presbyterian! It would be a betrayal of the man if he were to be caricatured in the service of modern struggles. In Patrick's time the population of this island was probably quite mixed – and the peoples of the island certainly had no understanding of the European idea of nationalism that goes back only a couple of hundred years. Patrick did not distinguish between the local and new comers like himself. He sought to find common ground with those he met here. He did not play on differences but knew that faith could build bridges rather than walls. After all, when we look back at the political struggle in Ireland about 100 years ago, it is good to remember that Edward Carson and the landed gentry were Irish born – while James Connolly came from Scotland and Eamon DeValera was born in New York and with a Spanish father. I think that Patrick would ask people today to acknowledge that the Irish are the people who live on the island of Ireland. Just as there were warring tribes in Patrick's time, so too we have to live with difference. And people of faith will always see war and conflict as, at best, a terrible failure that gobbles up the most vulnerable. In this year of centenaries he might ask us to look back with forgiveness for conflict situations rather than with pride or arrogance. We can look back on with admiration for people who died, often heroically, but with much less adulation not for those who wanted to kill. Conflict – whether WWI or the Easter Rising – are always signs of the failure of human relationships, never a model to be imitated or glorified. The challenge for leadership at all levels here is to develop a shared story about a divided history. Only then can we talk about a shared future. Patrick and the Gospel would ask us to create an identity that unites not divides and to promote reconciliation, like he did with his former captors. He may have called himself a 'most unlearned sinner' – but he had a wisdom in sharing the Gospel. It is that uncomplicated wisdom that he asks us to imitate today – not merely some sentimental memory that gives reason for a party but provides no healing for the hurting heart of so many. Thirdly, part of Patrick's problem was that he challenged the powerful of his time – political and religious. The strong – whether in church or in state – will always tend to analyse problems and to see the world through their eyes. It is easy to presume that God is on my side and that I represent virtue. And where church and state are too closely aligned, people of faith can lose their prophetic voice. But at the edges is where faith is always at its best and most uncomfortable. That is why Pope Francis has told us to be a poor church for poor people. He has called on us to go out to the margins. As we will see in Holy Week, that is where Jesus went and where he died. He was not crucified because he stood by the high priests, scribes and Pharisees. He died because he dared to criticise them. The Churches on this island – and especially in the North - have a wonderful opportunity to work together and to speak uncomfortable truths to those in power. We might well lose some support and have to pay a price. But our concern has always to be for the comfort of the weak not for our own comfort. Thus today we celebrate hope and not merely nostalgia. We celebrate not just the present moment but the struggles of the past and the birth of a better future. St Patrick is not just about a green White House and a green Taj Mahal. It celebrates one of the countless saintly heroes of human history who have not wallowed in self-pity or in the shedding of blood, in self-indulgence or in arrogance but in the celebration of divinely given human dignity and abundant forgiveness. If we want to be children of Patrick, he asks us to be uncomfortably real – and not to be bewitched by a sham-rock or by a sham-anything-else.